Viewing the planet and all its wonders through glass, is something humans have been doing for hundreds of years. Whether it’s peeping into a spy glass, telescope or window, our take on the world has often to be filtered through a frame. Now, a new generation of tougher, smarter, more resilient structures – architectural pieces with endless potential for looking beautiful – are offering new ways of using glass to experience the world and its wonders. They are enabling visitors to appreciate the planet’s most breath-taking sights up close and showcasing the work of glass manufacturers like Pilkington. Here at Pilkington glass UK, we are always keen to celebrate glazing innovation – and highlight new ways glass can make life amazing. And these stunning walkways, glass skylights, viewing platforms and floor-to-ceiling windows are a sight to behold – and something we’ll all be seeing more of. The biggest and best of them all, and one that’s inspiring us and making our hearts sing right now, is the Grand Canyon Skywalk. These pictures say it all – about the stunning scenery, the epic scale and the sheer audacity of building a path this high. A triumph of engineering and glass technology over nature, it puts visitors at the very heart of the canyon – spiritually and physically. We love everything about this amazing creation but we’re aware these things are subjective so feel free to get in touch and tell more us more about the glass structures you admire most. 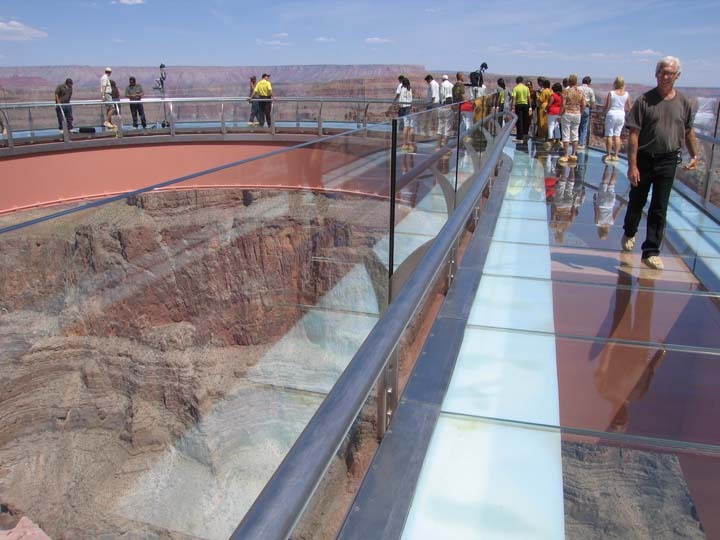 Suspended 4,000 feet (1219 metres) above the Colorado River and costing £15.3 million, the 70 feet long path is the world’s highest glass floor. The brainchild of architect Mark Johnson, it can support the weight of up to 120 people and will withstand winds of up to 100mph, with the overhanging section containing shock absorbers to keep it from bouncing like a diving board.